At a time when formal health and safety training is being challenged on a daily basis, you may find this superbly produced Health and Safety DVD a breath of fresh air. Many health and safety training courses are expensive. These are tough times and it is getting increasingly difficult to justify expenditure associated Health and Safety Classroom Training or formal health and safety training courses. To put all this into context, the cost of putting any member of staff through a day health and safety course can be anything between £35-£500 depending upon the nature of the safety training course. Then add the cost of keeping that person away from their job for the day (at least £100, although this figure can be much higher). Now multiply those combined figures by the number of people who need health and safety training and you're looking at big numbers: Just to train 15 people in one health and safety subject can cost you £1350 minimum! Now consider the cost of 'The Health and Safety at Work DVD', for under £300 you can deliver health and safety training on health and safety induction, office safety, manual handling, introduction to fire safety, fire prevention, extinguishing fires at work, fire evacuation. In addition to this you can deliver sections of health and safety training and provide enough time for questions and answers well within an hour. Lost productivity from your staff being away from their jobs is kept to an absolute minimum and you can use this safety DVD time and time again. Now looking at our Health and Safety DVDs versus competition. If you look at the Health and Safety DVD market you will find that most individual health and safety DVD titles are at least £139 and that compilations START at £1000+. We think this is too much. 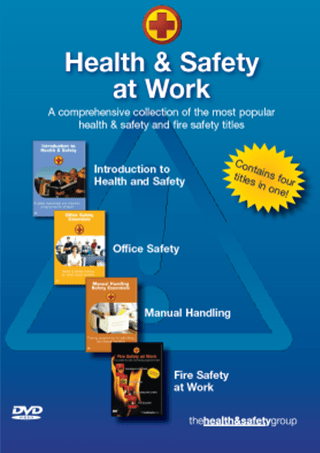 That is why we have produced high quality health and safety DVDs at sensible prices. We've proven it can be done and it provides you with true value. Furthermore, when you buy Health and Safety at Work DVD, you will be buying health and safety titles worth over £530. That is to say you are actually making a saving of £234 by buying the compilation Health and Safety at Work DVD! We hope this information has revealed the true value of this exceptional Health and Safety at Work DVD but if you have any further questions, please contact us on 0844 870 8770. You can buy the 'Compilation Health and Safety DVD' (see below) and save over £200 on buying key Safety DVD titles individually + GET A FREE DVD PLAYER!